This past week in the 2016-2017 PBA Philippine Cup saw victories come for Blackwater, Phoenix, TNT, and ROS! The Blackwater Elite hit a new milestone for the franchise after they stumped the GlobalPort Batang Pier, 99-91, in an Oppo PBA Philippine Cup clash on Wednesday at the Filoil Flying V Center in San Juan. With the victory, Blackwater improved to 4-2, marking the first time in franchise history that the team has reached four wins in a single conference. The previous franchise record was three wins and this current Elite team topped it with five games left to play in the elimination round. Rookie Mac Belo, a big part of Blackwater’s turnaround this season, led the way with team-highs of 20 points and six rebounds. He also grabbed two steals and went a perfect 11-for-11 from the free throw line. Nard Pinto added 15 points and six assists while Art Dela Cruz added 13 points, five rebounds and five assists. Blackwater, which started the season with two straight wins, have now won back-to-back games again since snapping a two-game losing skid. GlobalPort, which had won three of its first four games, dropped to 3-2. Mac Belo (BLA) - 20pts, 6rebs, 2stls, 1 triple. Terrence Romeo (GLO) - 22pts, 8rebs, 9asts, 2 triples. The Phoenix Fuel Masters trailed by 10 points heading into the fourth quarter but completed a huge comeback behind rookie Matthew Wright, who led the team to a 94-90 victory over the Meralco Bolts on Wednesday at the Filoil Flying V Center in San Juan. Wright finished with 22 points – 17 of those coming in a red-hot fourth quarter performance for the former ASEAN Basketball League star. He shot 7-for-11 from the field and 2-for-3 from beyond the arc while also grabbing eight rebounds and tallying three steals in the win. Phoenix snapped a two-game skid to return to .500 at 3-3 while Meralco, which surrendered a double-digit lead in the fourth quarter for a second straight game, fell to 2-3. Matthew Wright (PHX) - 22pts, 8rebs, 2asts, 3stls, 2 triples. Reynel Hugnatan (MER) - 15pts, 7rebs, 5asts, 3 triples. The TNT KaTropa cooled down the three-game winning streak of Alaska as they grounded the Aces, 109-100, in the Oppo PBA Philippine Cup on Friday at the Philsports Arena. Troy Rosario knocked down six of his nine three-point attempts to finish with a game-high 26 points as well as six rebounds while Jayson Castro and Larry Fonacier each added 16 points for the KaTropa. 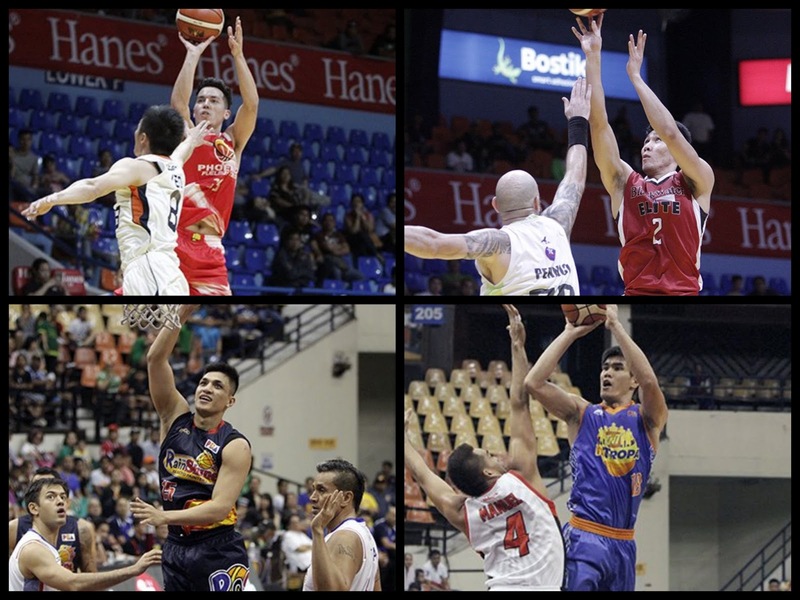 Castro also led TNT in assists with six while Ranidel De Ocampo chipped in with 10 points and eight rebounds. The KaTropa shot 45-percent from three-point range, knocking down 14 triples in the game. They also dominated the rebounding battle, grabbing 53 boards to Alaska’s 44. With the win, TNT moved up the standings, settling into a tie with the Blackwater Elite for second place at 4-2. Alaska, which had won their last three games heading into the matchup, dropped to 3-3. Troy Rosario (TNT) - 26pts, 7rebs, 1ast, 1stl, 6 triples. Calvin Abueva (ALA) - 18pts, 12rebs, 4asts, 2stls, 1blk, 1 triple. The Rain or Shine Elasto Painters showed up their former coach, Yeng Guiao, as they came back from a 12-point deficit to defeat the NLEX Road Warriors, 107-97, in a big Oppo PBA Philippine Cup win on Friday at the Philsports Arena. Rain or Shine trailed by double figures at halftime and by five points at the end of the third quarter but still managed to grab the win after a strong fourth quarter where they outscored their opponents by 15 points. Jewel Ponferada led Rain or Shine with team-highs of 22 points and nine rebounds while Jericho Cruz scored 19 points – eight of those in the crucial fourth quarter. Jeff Chan and James Yap added 16 and 13 points, respectively, combining for six three-pointers between them while Gabe Norwood chipped in with 11. Rain or Shine improved to 4-2, tying TNT and Blackwater for second to fourth places while NLEX was sent crashing down to 1-5 after a fifth consecutive loss. Jewel Ponferada (ROS) - 22pts, 9rebs, 2asts, 2blks, 1stl. Sean Anthony (NLX) - 22pts, 16rebs, 3asts, 1stl.